The Luvion Fetal Doppler is a safe and easy to use device that has been especially designed for use at home, allowing pregnant women to listen to their unborn baby's heartbeat, movements and hiccups from as early as 12 weeks. It can not only reduce the expectant mother's anxiety but also allow other members of the family to listen to the baby’s heartbeat. 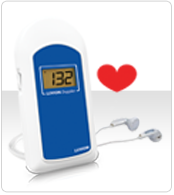 Two headphones can be connected to the Doppler so you can listen to the baby’s heartbeat together with your partner. The Luvion Fetal Doppler can be connected to a computer to record the baby’s heart sound and you can share your baby's heart beat with family and friends via email.